Granular claw crab found in an intertidal area of Calvert Island. Note the granules covering the larger claw. Photo by Cody Gold. The granular claw crab is a Lithodid crab, meaning it has three pairs of walking legs and a fourth pair that is either absent or reduced. Its grey-brown carapace is pear-shaped and covered in blunt spines and orange granules. The carapace grows to 4 cm wide, and has a short triangular rostrum. The crab's soft abdomen is flattened behind the carapace rather than completely folded underneath. Its claws are unequal in size: the right is much larger, and is covered in dark blue granules. The granular claw crab shelters in inventive hiding places such as within crevices and shells, in abandoned sea urchin holes, between anemones like Anthopleura xanthogrammica, and under mussels and encrusting coralline algae. It lives in the intertidal zone to a depth of 18 m (60'), and is found along open coasts from Alaska to Monterey, California. It is also found along the coast of Japan. The abdomen shape and large right granular claw distinguish this species from other similar Lithodid crabs, such as the scaled crab (Placetron wosnessenskii) and the highly-spined red fur crab (Acantholithodes hispidus). 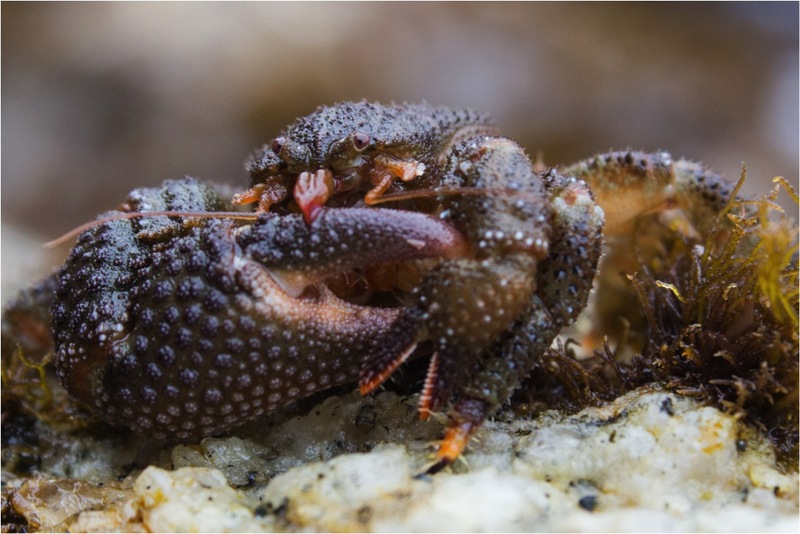 Granular claw crabs are often found in pairs. Cowles, D. (2007). Oedignathus inermis (Stimpson, 1860). Invertebrates of the Salish Sea. Rosario Beach Marine Laboratory. Accessed 05/02/2013. Hart, J. Oedignathus inermis (Stimpson, 1860). In Klinkenberg, Brian. (Ed.) E-Fauna BC: Electronic Atlas of the Fauna of British Columbia. Lab for Advanced Spatial Analysis, Department of Geography, University of British Columbia, Vancouver. Accessed 04/02/2013.